Do you feel like there is a faster way of doing things, but don't have time to figure it out? If so, I'd like to invite you to enroll into this free course. There are 3 lessons that demonstrate the features, functions, and principles that will help you use Excel to get your work done the fast way. NOTE: Be sure to add only ONE (Quantity 1) to your cart. If you checkout with more than a quantity of one, the store will assume you are a training coordinator instead of assigning the course to you as a student. Change quantity to 1 before checkout. 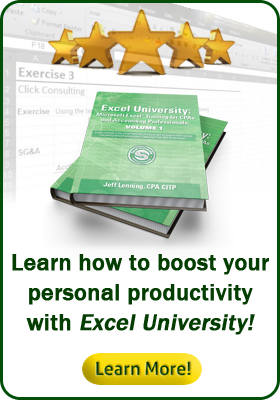 The course includes mini-lessons from the Excel University series, as follows.